Kenneth Dakan, Alexander Dawe, mark Wyers, Alev Ersan, Arzu Akbatur, Abigail Bowman, Feyza Howell, Amy Spangler and kate ferguson. When this dropped through the letterbox earlier this year, i noted on twitter that it was one of my favourite covers the lonely dog on the cover maybe lets you into more what is on the inside. that is one woman getting to grip with her own fathers death. This collection won the European union prize for literature in 2014 and meant this wonderfully short book could get a wider audience. Birgul lives in Istanbul and has written both fiction and non fiction in her time. MY MOTHER DIDN’T GIVE BIRTH TO ME. On a whim she left me there under an acacia. And it came to be that I found myself at the foot of Acacia. It rustled and I held on, rustled and I held on. When I was still no larger than a bean I became the dark shadow of that looming tree. Thank God my mother set me free too soon. I am cool and I am alone. I am the image and the shadow and the oasis to the spirit of the acacia, dripping from its heavy boughs. sentence is anguish to the soul and I never tasted of it. I am solitude. I am that which is distant to the world. This is one of those books that falls between the lines of what it is a novella in stories, prose pieces or short stories. What we get is abstract poetic stories as one woman struggles to find the way to deal with her father’s death. His past as he grew up in the violent years of Turkish rule in the late 1960’s. There is recurring motifs like acacia trees which crop up in more than one story I feel the wider brim of the acacia is a metaphor for the lost father in a way . Metaphor as well water trickling is like her father’s life as it trickled away from him. A journey through the ways we mourn those closest to us.We also see the old Turkish life and the modern Turkish world clashing. The acacia began to sway back and forth with rage of the wind, at its roots lay those three acrid words, fallen like unripe fruit. Then it bent down heavily, as if to unload its entire weight onto that of the morning in an aching march, delivering a clumsy sentence in a voice dark and deep yet vaporous. Acacia again from one of the last stories but a bent broken tree now . This is a short work 88 pages long and as I said is hard to pin down thew language is rich and given the fact it was worked on at a ten-day workshop for Turkish literature means you can see how many translators have tighten Birguls words to the beautiful piece we get here. Another triumph for world editions rarely do we see such short works as this translated into English. Birgul uses a variety of styles from poetic prose , to songs and short stories as she put in her winning speech for the european union Literature prize she wove these styles together like a cloth. She started writing the book after the loss of her own father. As her way to deal with the rage and loss of her father she also said this in her winning interview. A great new voice from Turkey to read. Have you a favourite Turkish writer ? As I said the day after he died I had intend to review this as one of the man booker hopefuls, not knowing how the rules fully stand it still may be in the running. I enjoyed this and am sad that it will be his last novel as far as we know at the moment, as Eco always considered his novel-writing a hobby that he just did at the weekend as a diversion from his academic work. Another topic was denial. We were still a newspaper without any readers, and so there was no challenge any of the news that we provided. But a newspaper is also judged by its capacity to handle denials, especially if it’s a newspaper they shows it doesn’t mind getting it’s hands dirty. Also, by training ourselves for the real denials when they came., we could invent letters from readers that we follow up with a denial. just to let the commendatore see what we are capable of. this is so Borges a paper with out reader with readers letters hence the title Numero Zero. Numero Zero is set in Italy at two times the first is a story of the end of the world war two the last few days of the tyrant IL Duce following his capture by the partizans, til he was executed and his body was buried in an unkown grave or was it !.Now shoot forward too 1992 Collonna a hack is hired to write a ghost paper , a number of scandal written newspapers for a fake newspaper that is part of a great scheme b the owner of that paper , along the way he runs into a conspiracy freak. That tells him a whole tale of the 1945 Il duce story and that is they caught a double and that the real Duce was smuggled to Argentina by the Vatican. This is maybe to mad a story for the paper.There is many more twists and turns in this Classic eco tale. THe double theory explained a very Borges Idea and also a classic piece of Eco. This was classic Eco in a way. But also I said maybe it was Eco Lite, this was a short novel felt like a first draft of something that could have been more expansive in its scope. Although it had many echos to his earlier books in style and setting in Milan. As ever he had many illusions to classic piece of Lit high and Low for me Collonna was very much in the hack crime writer of detective novels from the 1940’s . There is a large tip of the hat to Borges , that Alberto Manguel mentions in his guardian review ,where as Borges worked lit gems in short stories I always felt Eco expand the style and sort of stories that Borges used into a longer novel form and this is now exception with two Motifs the double and the detective story are both motifs you often find in Borges especially the double the mirror image! He had been called the thinking man Dan brown in recent years and I wonder if this was a clever nod to Mr brown as he has a vatican conspiracy in one of his books (I have seen the film but not read his books ). This would be a great Man booker book if still eligible from one of the most consistent writers of the last thirty years .A sad loss to World Lit, but at least I have his books to reread and add to the blog over next few years. I want to read this when it came out and a chance look on my library website the other week and Iw as shocked they had a copy, this book is considered the first modernist novel written in Irish Gaelic. Máirtín Ó Cadhain was heavily involved in the republican movement in the 1930’s. He worked as a journalist wrote short stories and published this book in his lifetime since his death two more novels have been published. I will be changing my quotes here slightly and using the opening of chapters, this is because next month Yale through Margellos world republic of letters the same imprint as this book is from are publishing a second version of Cre na cille in translation, which I intend to read and at that point will compare the wording in both translations to see what is different. The opening chapter The Black earth and a new arrival in the earth wonders did her husband listen to her! Now back to the book the dirty dust is set in the graveyard of a small town of connemera. What we have is voice of all those buried there talking away as each person arrives in the new grave they are set upon as the dead try to find out what has happened between burials. This sees old feuds carrying on wounds open wider in the earth from the time the new republic was formed and who was on whom side. You get caught up in this world of voices and often forget it is the dead that are speaking.This is like being in a busy Irish pub in that cacophony of voices all talking at once. -The light of the sun is mine, the shining moon, the sparkling star..
-The mysterious recesses of every cave are mine, the jagged pits of every abyss, the dark heart of every stone, the unknown guts of every earth, the hidden stem of every flower..
-Mine is the dour north, darkness, misery, the shoot that gives life to the rose petal, the web of veins that drives the diseased blood of melancholy routing laughter from the cheeks to lighten the brightness of the face.. I choose the opening of chapter 9 The wasting earth as the detached nature of the voices is very Beckett like . This is a hard book to describe because that is what it is the dead talking and talking in that irish way of the crack these have all kissed the blarney stone and have the gift of the gab. Cadhaim wrote the book in 1949 so the same year Beckett brought waiting for Godot out. Brian O’nolan was writing absurd piece for the papers as Myles na gCopaleen . two of his contempary . I choose these two as they seem nearest to him this book must have been read by Beckett there is part of this that reminds me so much of his later plays the detached nature of the voices in the book is so like those plays. As for O’Nolan he seems to poke fun at the irish establishment the same way O’Nolan did in his Myles character.Why it has taken 66 years to finally reach us in English I don’t know but know we have it we see what a lost gem it is and a missing piece in many of ours Irish lit knowledge. Another gem from world Republic of letters. Have you read this or any Gaelic novels ? Winston weekend Bye Umberto and how many books have I left ? I could not mention the sad loss of Umberto Eco which was announced on Friday I was due to review Numero Zero as part of my MBIP2016 possible this week so I will still do so. As I have only Prague cemetary under review here fter it was on the IFFP a few years ago , I actually own all his novels baring that and Numero zero which is a library book. He was a talented writer that liked to play with Genre of Fiction and also raise genres like the thriller to a higher lit level. He was also a talent academic and expert in semiotics. His loss is sad from those early William weaer translation that showed what great books and great translators can do ! The loss of Umberto makes me thing of time and how many books we have left to read , I read this piece on times flow stemmed .Books that made my ears burn where he finishes the piece of with his estimate total of books he has left to read. Well I had a quick add together of saying 100 books average a year , I read 120-130 the last fie years a 100 seems a fair guess and I have said another 40 years for me which seems fair we are long lived in my family so that is maybe 4000 books I have left maybe more. a few more journeys around the globe.But which books , That is becoming a point I seem to want to try more exotic books all the time those translated gems that many miss and I feel more of these will appear as 40000 isn’t enough to waste time on poor books or even hyped books .As I aim to read my 4000 and have a few more . How many books have you left ? 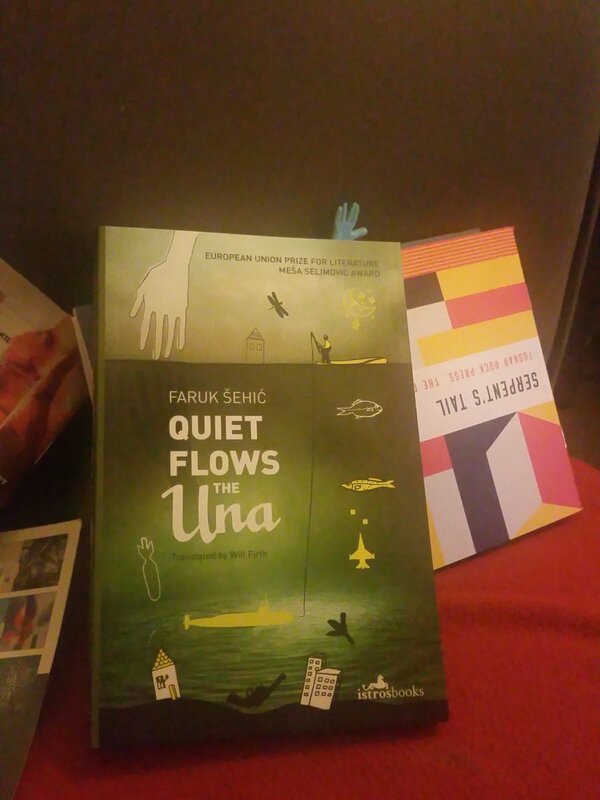 Two books that I received this week .The first is a Novel that follows one man’s journey through the past through the Bosnian war , but also the world around him the river Una and also the flights of fancy every child and young man has. The book has the original cover and illustrations that were in the Bosnian edition of the book. This book won the European union prize for literature. 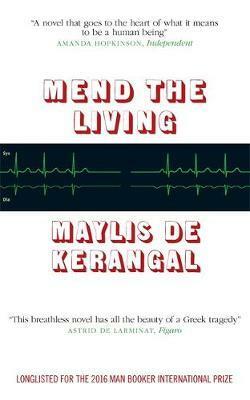 Another gem from Istros books who as ever is bringing us the best of Balkan Lit . Another arrival is a book I was told about a couple of years ago. I was lucky with a couple of other blogger to have an afternoon tea with the great Christopher Maclehose. 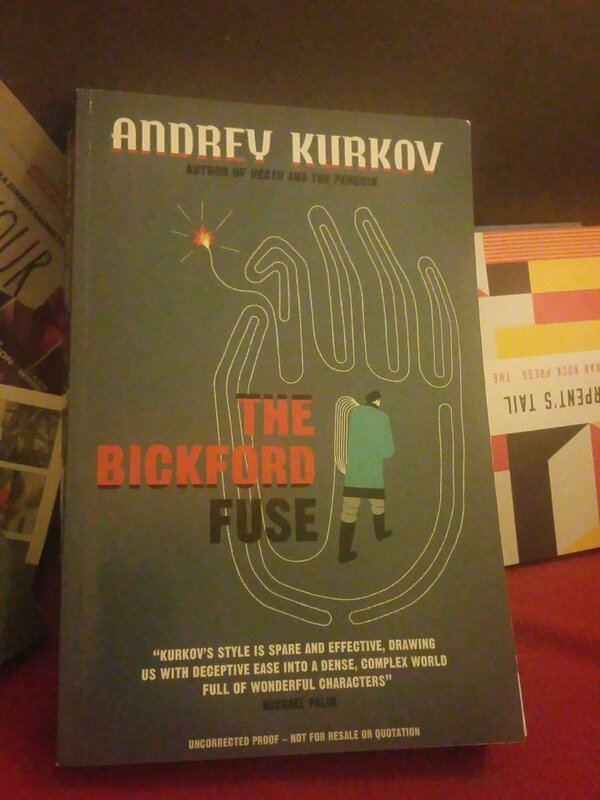 Whilst having tea we were told that this book had just been signed to be translated and that Kurkov considered it his best book The book follows characters through the soviet years from the end of world war to to the edge of the crumbling communist world . The title comes from the inventor of the fuse for Dynamite. The book has a lot of what is best in kurkov it say I have reviewed two of his books before The milkman at night and his famous death and the penguin and love the way he shows the madness and satirical side of the communist years. I carry on with my journey through books on the MBIP2016 contenders. This is the first if two Peirene titles that could be on the longlist and given Peirene recent history of always having a book on the old IFFP longlists it is a good shout that they should have one this year on the new prize. This was the debut novel by Finnish writer Aki Ollikainen it won the best debut novel in Finland the year it came out and even cooler was the fact the book had won something called the Finnish book blogger book of the year. The colour of death is white, at funerals, people wear black, the living that is even the deceased is in black, because he is dressed in best clothes he owned while alive, but his face is always white. When the soul leaves a human, only white remains. The color is being drained from Juhani’s face the first to go was red, the colour of blood. Red changes into yellow, then yellow too, vanished, leaving grey, which is now gradually fading into white. A brilliant description of the way a dying person turns sallow in the way they look then white after death. Marja is the main character in this story we follow her and her two children as we follow her on her journey to try to get to the Russian city of \St Petersburg where she has heard there is bread to eat and food available. This is 1867 and it is the second year in the 3 year Finnish famine. This was after three rainy years that saw crops fail which like Irish potato famine of the 1840’s the finnish problem is caused because they rely on Root crops for the main stable of their diet. What we see in part as the story of Marja desprate journey is the wider story that of the finnish government through a senator who didn’t want to borrow money to save the population The minister Snellman struggles to cope with the crisis that has gripped his country (there is a good wiki page with info on these year ).This is one womans journey through hunger to save her kids and the boy they manage to gain along the way. as they survive on thing like poisons lichen bread and Pine bark. By way of a response, the senator feels an icy breath on his face. He spent the whole of yesterday leafing through the bible, reading about Joesph’s prophecy, about those seven lean and those seven fat cows. Years of crop failure have now passed, one after the other, but there is no sign of the fat cows on the horizon. Has his incessant talk of finlands beautiful forests been in vain ? are these people good for nothing, apart from tearing bark off trees to supplement their bread. I loved this when I read it last year but as always I put it to one side and decide a quick reread and found myself even more captivated by the way Aki capture Marja desperate life. This is as one may say a warts and all account of a journey into hell. This uses one womans life to paint a great picture of true horror that saw one in five Finns die during these years of famine a really interesting story of famine hunger and the search for hope that isn’t just Finnish but universal in the nature Marja could be Mary on her way to Dublin , or Maryse on her way to Addis Ababa and so on. In 130 short ages Aki has maybe done a better job than Hamsun did in his great book Hunger at putting over how it feels to be hungry and struggling to find that food. Well it has come round again . We have a new name no more Independent foreign fiction prize, no we have The new combined prize the Man booker international prize it is the same roughly as the IFFP was on March tenth we get a longlist of 12 or 13 book (we may do the same as last year and call in a book ourselves if we think a great book has missed the cut like the zone last year ) Then around the 14th April the day the actual shrotlist is announced we will announce a shadow shortlist then a winner in May . Stu Allen is returning to chair the first Man Booker International Prize shadow jury after hosting four shadow IFFP juries. He blogs out of Winstonsdad’s Blog, home to 500-plus translated books in review. He can be found on twitter (@stujallen), where he also started the successful translated fiction hashtag #TranslationThurs over five years ago. Tony Messenger is addicted to lists, and books – put the two together (especially translated works) and the bookshelves sigh under the weight of new purchases as the “to be read” piles grow and the voracious all-night reading continues. Another Tony from Melbourne Australia, @Messy_tony (his Twitter handle) may sometimes be mistaken for the more famous Malone Tony but rest assured they’re two different people. Messy Tony can be found at Messengers Booker (and more) and at Messenger’s Booker on Facebook – with a blog containing the word “booker” why wouldn’t he read this list? Bellezza is a blogger from Chicago, Illinois, who has been writing Dolce Bellezza for ten years. She has run the Japanese Literature Challenge for 9 years, and her reviews can be found on publisher sites such as Penguin Random House, Simon and Schuster, Peirene Press, and SoHo Press. It is her great joy to participate in the shadow jury for the Man Booker International Prize with fellow participants who are experts in translated literature. Man Booker international what will be there ? I ‘ve been busy reading a few books I think may been on the longlist in March hence lack of blog reviews i’m trying to get a few more books read before the longlist comes out on March the 14 . I just finished The great swindle maybe a hidden gem from last year a slow building story of three con men post world war one, I have White hunger to reread early next week the Patrick Modiano from Bloomsbury on its way from the library. The new marias and knausgaard on order from the library when they come out . I have a couple others to reread and review so a busy few weeks in prep for the longlist due on March 10th . I will be doing a longlist prediction post on books I have read just before the longlist and we have our shadow jury ready. But what I want to know what have you read last year in translation or know is due out in the next month or so that may be on the longlist ? I for one was very caught out with last years longlist leaving me the most books to read in the 4 years we have had a shadow jury so this is maybe a quick what have I missed and can you help me with a few suggestions ?